The advantages Catamarans have for the home builder are that they are cheap and relatively simple to build, depending on the design. The hulls can be simple V shaped stitch and glue constructions connected by a timber bridge deck, as in the famous Wharram designs. 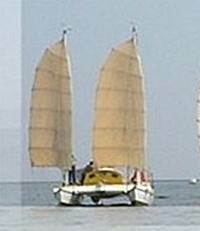 Multi hulled boats have been in use among fishing and seafaring communities since time immemorial. 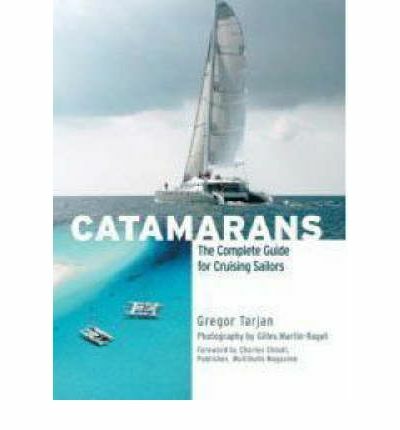 The word, catamaran comes from the Tamil language of Southern India where they were used for fishing. And of course twin hulled vessels have long been in use in Polynesia. The Polynesians covered huge distances across the Pacific in their quest to settle some of the worlds most isolated islands. Their vessels ranged from small outrigger Proas for fishing to enormous catamarans for voyaging. Despite skepticism from mono-hull sailors, multi hulled vessels have become popular for every type of vessel from tiny beech cats, pontoon boats, cruising sail boats to high speed ferries. For the home builder the greatest advantage is the ease of construction and the consequent cheapness. At sea the advantages are numerous. Because the multi-hull only heals slightly and doesn’t rock so much, there is less risk of seasickness than on a mono-hull. The ease of motion also reduces the risk of injury and from falling overboard. A lack of heal also makes life on board more comfortable and less tiring. Those narrow hulls are more easily driven at speed. While this is clearly an advantage for those seeking thrills on small boats, it can also cut journey times for the cruiser, allowing more time to enjoy that anchorage. The multi hull’s shallow draught means that they can sail and moor in shallow water, and because the twin hulls keep her level, drying out on a beach or drying anchorage is a breeze. The bridge decks of larger cruising designs can be very spacious, making them an ideal place for relaxing while moored up. It is quite common the have netting stretched between the bow hulls also offers a superb place to relax and watch the ocean slipping by underneath. And having the accommodation split between the hulls allows for greater privacy for the crew. Having two hulls also means that if there should be an unfortunate accident it is unlikely that both hulls will be holed. In the early days of western sailing multi-hull design, there was considerable fear of capsize. The worry was that where a displacement mono-hull would self right an overturned cat wouldn’t. This lead to some being equipped with enormous flotation bubbles at the top of the masts. Since then it has become established that unless the boat is very light and being sailed at extreme limits, a capsize extremely unlikely. Having the accommodation of a cruising multi-hull divided between the hulls does limit the size of the cabins. This could be a disadvantage for small boat cruising and for living aboard. Many trimaran designs attempts to overcome this by having a larger central hull with smaller outriggers. Despite this many larger catamarans with large bridge decks and wider hulls are becoming popular as cruising boats. I want to put amas on my kayak for sailing.